Akemashite omedeto! Happy New Year, everyone! I hope ACUMEN readers all had a good break over the Christmas and New Year holiday period. After Australian and Singaporean Christmases in my previous two postings, it’s good to have Christmas actually falling in winter, as did those I grew up with in England. I know that, for most Japanese, it’s just another working day, but parts of Tokyo looked quite festive and Midnight Mass at the Franciscan Chapel Center in Roppongi—with its Filipino choir—was a great reminder of the essence of Christmas. With the Residence festooned with Christmas decorations, we hosted a number of festive events, including dinners with senior Japanese officials and businesspeople, where chef Freddie served up Turkey and the full trimmings. Many of our guests, such as Bank of Japan Governor Haruhiko Kuroda, commented that it reminded them of their time as students in the UK. I also managed to get down to Osaka to co-host the British Consulate General’s big Christmas reception there with our Consul General Sarah Wooten. 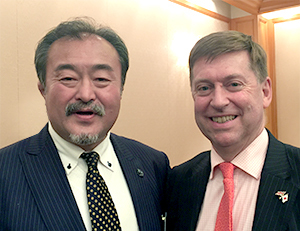 It was very well attended by locals, who have a wide range of connections with the UK—political, business and academic—and included rugby legend Toshiyuki Hayashi. I don’t know whether it’s just me believing stereotypes, but parties seem to be a little more lively down in Kansai. Whilst in Osaka, I visited Panasonic’s new museum, opened in 2018 to commemorate the 100th anniversary of the firm’s founding by Konosuke Matsushita. Panasonic is a significant investor in the UK. I was back in London briefly just before Christmas, where I met International Trade Secretary Liam Fox, Asia Minister Mark Field and Sports Minister Mims Davies. I also visited the global headquarters of SoftBank’s Vision Fund, which is investing $100 billion in technology firms from its Mayfair base. Back in Tokyo, I called on Tadashi Yanai, founder and president of Fast Retailing Co. Ltd., who are behind the Uniqlo stores. They have a signi­ficant presence in the UK with their European headquarters, and a number of stores in London and other cities. I told him that my family are regular customers. Professor David Richardson, the University of East Anglia’s vice-chancellor, came through Tokyo in December, together with Dr Simon Kaner, director of the university’s Sainsbury Institute for the Study of Japanese Arts and Cultures. The institute is home to one of the largest pools of expertise on Japanese arts anywhere in the world outside Japan. Mansai Nomura, the famous Kyogen actor and movie star, came to call on me at the Residence. He has also staged Kyogen and Noh versions of some of Shakespeare’s plays. He spent 1994 studying in the UK, and is now the creative director for the opening and closing ceremonies of the Tokyo 2020 Olympic and Paralympic Games, and I’m sure he is going to present spectacular events for both. Once a year, Prime Minister Shinzo Abe hosts a lunch for Japanese-speaking ambassadors serving in Tokyo. There are about 25 of us among the 150 or so ambassadors here. Most have made a long-term commitment to Japan, with several postings under their belt and many have Japanese partners. It is a rare privilege to have the opportunity to engage with the prime minister in this format. He was in the UK for meetings with Prime Minister Theresa May in early January. My wife Sarah and I were once again invited to attend two annual events at the Imperial Palace over the Christmas period. On 23 December, I put on my morning suit and, together with fellow members of the diplomatic corps, went to pay our respects on the occasion of the Emperor’s birthday. As we mingled with members of the Imperial Family, many of whom had studied in the UK, it was a little sad to recall that this was His Majesty’s last birthday as Emperor. On 1 January, the ambassadors were all back at the palace again for an audience to mark the New Year. We saw in the New Year at Suntory Hall, watching British conductor Alex Joel and the Vienna Volksoper Orchestra performing a selection of Viennese waltzes. The start of a new year is always a time of hope and expectation. It helps that, in Japan, it is usually accompanied by blue skies and sunshine. This year is going to be an exceptionally busy one for Japan. On 28–29 June, world leaders will gather in Osaka for the G20 Summit. There will also be some eight meetings of ministers—covering a range of issues, from finance to agriculture—held in cities around the country during the year. Japan aims to use its G20 presidency to pursue a number of themes, including economic growth and promotion of the rules-based multi­lateral trading system. Later, in Yokohama from 28 to 30 August, Prime Minister Abe will host the seventh Tokyo International Conference on African Development, involving many leaders from African nations. This year will, literally, be the start of a new era, with the Emperor abdicating on 30 April and handing the throne to his Oxford-educated son, Crown Prince Naruhito. The formal enthronement ceremony follows later in the year, on 22 October. I was living in Japan exactly 30 years ago at the time of the death of the Showa Emperor and the enthronement of the current Emperor. It felt like a very historical moment, as Emperor Hirohito had been on the throne for 64 years, during periods of major change and upheaval in Japan. So, I feel fortunate to be back here once again to witness an imperial transition. For Brits here, particularly, one of the highlights of 2019 will be the Rugby World Cup (RWC), which will run from 20 September to 2 November at 12 venues around Japan. Many of my visitors tell me that they will “have to” come back for important business in Japan around that time. With England, Scotland, Wales and Ireland all here, the British Embassy Tokyo and Consulate-General Osaka will be busy assisting the teams, supporting the tens of thousands of travelling British fans (we’ve already started our digital consular awareness campaign) and seeking opportunities to promote the UK. We will also be launching our UK in Japan 2019–20, which will run from the RWC through to the Olympics and Paralympics. It’s definitely going to be a busy year for us. Finally, many congratulations to British School Tokyo Principal Brian Christian for his well-deserved MBE, announced in the New Year’s Honours.